Saint Hildegard was a 12th century German abbess, (the nun in charge of a convent), who supposedly had prophetic and apocalyptic visions. The theological authorities at the time confirmed her visions as authentic. In addition to her prophesies about God and the end of the world, Saint Hildegard believed strawberries were unfit for human consumption. Because they grew close to the ground, she reasoned that snakes and toads contaminated them. Clearly her “vision” was shortsighted. According to the Food and Agriculture Organization of the United Nations, world strawberry production in the 1990’s averaged over 5 billion pounds a year. The US is the largest producer with California leading the way. 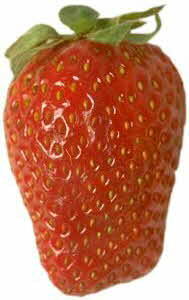 According to the US Department of Agriculture, the average American consumes almost five pounds of strawberries a year. Strawberries are a member of the rose family and are indigenous to the Americas, Asia, and Europe. They are the only fruit with seeds on the outside. The ancient Romans thought they cured a plethora of medical ailments while the French, (of course), believed they were an aphrodisiac. Anne Boleyn, the doomed second wife of King Henry VIII, should have stayed in France where she spent part of her childhood. She had a strawberry shaped birthmark on her neck which some felt proved she was a witch. So there you have it. The strawberry has been deemed a poison, a panacea, a love potion, and a demonic symbol. The common American strawberry is the result of cross breeding between the wild Virginia strawberry and a Chilean variety. It began in the 1700’s when a Frenchman spying on Spanish forts in Chile brought local strawberries home. This marriage produced a hardier berry, amenable to modern production and transportation. Strawberries are available year round with the peak season between April and June. They do not ripen after being picked. Choose firm, bright berries with their greens attached. Do not wash them until you are ready to eat them since they are highly susceptible to mold. Store them in your refrigerator in a container, in a single layer on dry paper towels. Strawberries are high in Vitamin C and folate, and provide some potassium and iron. Plus, one whole cup of strawberries only has 55 calories. My favorite way of eating strawberries is by simply dipping them in homemade whipped cream. Never made homemade whipped cream? Shame on you! It’s so easy and tastes so much better than the canned. First, refrigerate the cream and stainless steel bowl, as this will facilitate greater volume. You must use heavy cream as well. Pour the cream into the bowl and begin whisking. Be patient, it will eventually come together. When it reaches the soft peak stage, (a loose coagulation), begin adding sugar and a little vanilla extract. Continue whisking, tasting intermittently for additional sugar and/or vanilla, until a firm whipped cream is produced. Don’t over-whisk or it will become grainy and lumpy. Dip the strawberries in the cream and taste a little bit of heaven. Another classic strawberry presentation is in a salad with balsamic vinegar. Yes I know it sounds like a strange union but believe me, it tastes great. Mix one quart of sliced strawberries with one to two teaspoons of balsamic vinegar and sugar to taste. Then add chopped mint leaves. This is a simple, elegant, and very tasty dessert. It is low in calories and perfect for summer. Now for something more elaborate.